A protest againt the dam. Photo by International Rivers. On May 24 the floodgates were opened on the contentious UN backed Barro Blanco hydro dam in Panama, sparking forced removal by authorities of indigenous Ngabe communities that are living in protest camps near the dam site. With construction finished, GENISA, the company that owns and operates the dam, has begun to flood the reservoir today, which will inundate six hectares of indigenous territories. According to the Movimiento 10 de Abril (M10) — a group representing indigenous peoples directly affected by the project — 35 community members, including women and children, were arrested and are currently being held in police custody in the Missionary Center of Tole. Following the arrests, backhoes moved into the area to tear down their encampments. Local Ngabe organizations are now on high alert and are planning on taking further actions to oppose the dam, which is financed by the German and Dutch national development banks (DEG and FMO) and the Central American Bank for Economic Integration. 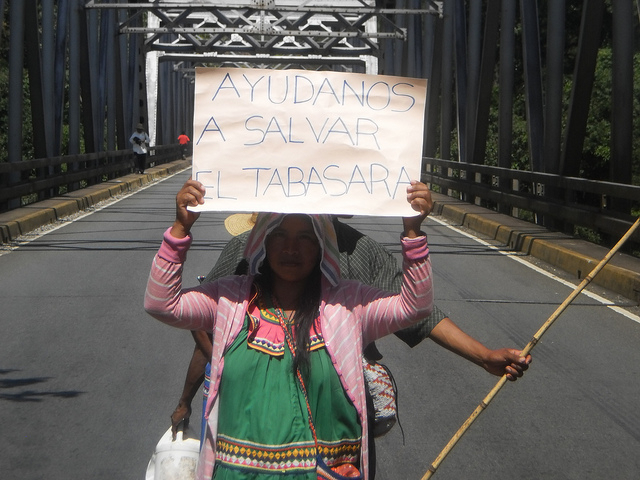 Already fearing that the situation will escalate, international NGOs launched a petition in April 2016, calling on President Juan Carlos Varela to ensure that the affected Ngabe people are free from intimidation and repression. The petition has been signed by 84,000 people to date. “We, the affected communities, have never given our consent to Barro Blanco. This project violates the Panamanian Constitution and our indigenous rights. ASEP has not warned us about the imminent flooding that will destroy our crops, some of our houses and kill our livestock,” declared Manolo Miranda, spokesperson of the M10. National and international organizations are deeply concerned for the personal safety and security of the Ngabe people and call on Panama to protect their rights including the rights to security and peaceful assembly. In 2015, Panama recognized that the Barro Blanco project had been approved in violation of the Ngabe’s social and cultural rights, and the government temporarily suspended the construction of the project. A few months later, the government fined the project developer $775,000 for failing to adequately consult, relocate and compensate those adversely affected by the dam. To this day, the government has not reached an agreement with the communities. Barro Blanco is an UN-sponsored project that is designed to support sustainable development in poorer countries while enabling wealthier countries to achieve emissions reductions cost-efficiently. However, Barro Blanco demonstrates how climate mitigation projects can have adverse impacts on peoples and communities and the environments on which they depend. The Paris Agreement recognized the need for human rights protections in climate action and created a new Sustainable Development Mechanism (SDM) under which all countries will be able to generate and/or use credits to offset emissions. Parties of the UNFCCC are currently meeting in Bonn to discuss the modalities and procedure of the new SDM. “Barro Blanco is a clear example of why human rights protections must be included in the newly established SDM. The SDM must learn from the CDM’s mistakes. As the Paris Agreement committed to protect human rights, Parties must ensure that another Barro Blanco never happens again” said Pierre-Jean Brasier, Network Coordinator at Carbon Market Watch. A report to be published this week by Carbon Market Watch and Misereor also highlights the need to incorporate human rights into climate action, including the case of Barro Blanco.